I decided I would try the Buck Creek Trailhead as my next jumpoff point into the Eagle Cap Wilderness and the Minam River. 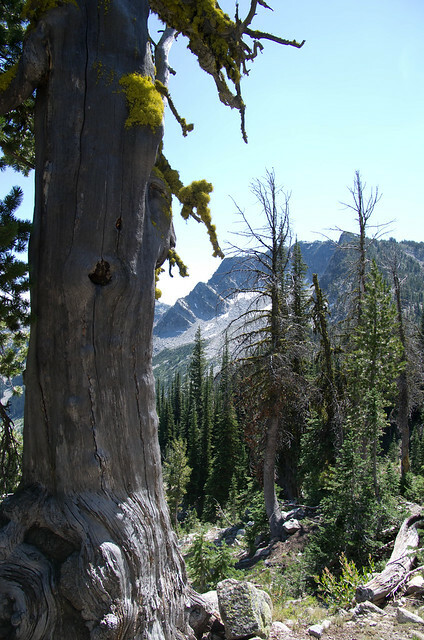 This trail is about 12 miles and goes over 8,000 ft high Burger Pass. It reaches the Minam River fairly high in the system around nine and a half miles downstream from where the river begins at Blue Lake. Technically the Minam River is supposed to start at Minam Lake but the water has been diverted to the Lostine River to provide irrigation. I had wanted to do this trip in 4 days. A day to hike in, a day to fish 3-4 miles upstream, a day to fish 3-4 miles downstream, and a final day to make the 12 mile long hike out. I started out with a normal two day weekend, but when work looked slow on Monday I added a third day and decided I would use it to make the long hike out. Buck Creek Trailhead was not too hard to find, but my Eagle Cap Ranger District map didn’t appear to be accurate. I am not sure where it went wrong, but the roads aren’t exactly like they show. If you know about where you are going you will be able to find it though. Molly (my border collie) and I arrived at the trailhead about 9:00 Saturday morning. There were two men with about six pack mules and two riding mules trying to get situated for their start up the trail. They seemed to be having a little trouble. The first guy was mounted and waiting while the other guy struggled for some time out of sight behind the trailer. I just kept hearing him cuss. I didn’t want to get in the way of the guy with his string of mules on the trail so I pretended to look at my map and let them get on their way. When he finally emerged from behind the trailer his gear was about as shiny and new as his pickup and trailer. I hate to read a book by its cover, but this guy didn’t look real experienced. But perhaps he just came into some money and was able to buy all new gear for himself and his mules and this was their first trip with the new gear. Molly and I started on the trail after giving them some lead time and I was happy not to see the guy broken in the brush somewhere and his mules running off. As a side note, my first horse was a mule, Minnie Pearl. So I know how mules can be. Minnie Pearl kicked me half ways across our front yard once when I was trying to crawl up into the saddle. She was a small mule, but I was even smaller. With one hand on the horn, I was trying to grab the cantle of the saddle with the other hand so I could pull myself up. My hand slipped off and I probably groped her flank a bit. She didn’t care for it and let me know with a quick kick to my belly which sent me sailing. I was probably 6 years old or so. Good lesson, don’t touch horses on the flank . . . or mules. Minne Pearl was smart though. My oldest brother Roy received her as a gift when he was 4 years old from my Grandpa Clark. I am told that when Roy would ride her, mule and rider would do fine while my parents were watching. Then when the adults went out of site, Minnie Pearl would walk behind the barn and sit down. Now that is a smart mule. I have a picture of my dad helping Roy onto Minnie Pearl on the Imnaha, probably on the ranch my other brother Monte was born on. Back to the present. It seems that Buck Creek trailhead should really be called Elk Creek Trailhead since trail # 1944 is Elk Creek Trail and it goes all the way to the Minam River. Unlike most of the trails that go into the Wenaha, this trail goes up and then back down before getting to the river. So the trailhead starts out around 5,500 feet, climbs to 8,000 feet at Burger Pass, and then drops to the river at about 4,900 feet. The hike in only gains 2,500 feet compared to the 3,100 feet gain hiking out, but the first couple miles of trail from the trailhead could really handle having some switchbacks added. It wasn’t terrible, but there were plenty of spots that made me breathe a little heavier. The beginning of the trail isn’t real special. 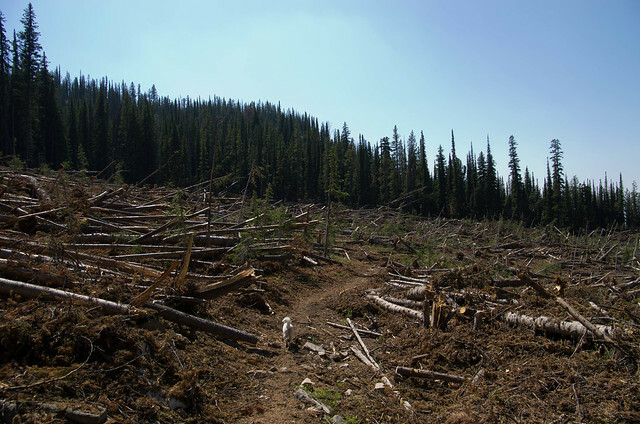 It meanders its way through logged over timber and you can’t see much past the surrounding trees. As the trail gains elevation you begin getting some great views back towards the valley though. I could see the Elkhorn range of the Blue Mountains towering over the valley below. Unfortunately it wasn’t a very clear day, but I still got some pictures that I liked. Burger Butte also begins to be a prominent landmark. It appears as a towering chunk of rock and at one point I came into an area that looked as all the trees had been knocked over or broke off by an avalanche that began at Burger Butte. As I made the last few steps to the summit of Burger Pass craggy granite peaks began to show themselves. It was really a pretty sight. A little below the 8,000 feet high pass I could see Burger Meadows with lush green grass cut by the serpentine path of a small creek. This country seems to be one of extremes. Big open meadows are followed by steep, rocky drops of exposed granite. 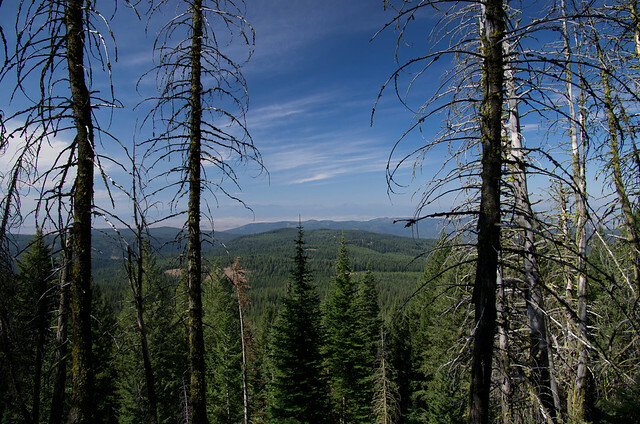 One area flat and full of greenery, the next area scattered with the twisted dead remains of trees that tried to grow on the nearly vertical face of granite. The trail began to zigzag its way down rocky granite slopes. This particular area looked like excellent cricket habitat as there was a large number of them bumbling along out of my way on the trail. I wish those big crickets were down on the river bumbling their way into the water and into the bellies of waiting trout. When I had been walking about ten miles my left foot began to tell me that it was tired and thought it was time for a rest. Rather than stopping I tried to quicken my pace as I knew I only had another two miles to go and then I could give my left foot a rest. A wooden bridge crossing the Minam River soon came into sight. I stopped in the middle and looked down through clear cold water with colorful rocks on the riverbed. If the fishing wasn’t any good it would be a shame because it is such a pretty little river up here. I made camp a hundred yards or so downstream of the bridge off the beaten path and out of sight of the trail. Making camp was enough of a rest for my foot and I strung up my rod to make use of the late afternoon and early evening. I started with a big fish setup; a streamer followed by a couple nymphs. I fished my way upstream for some distance without hooking a single fish. I had passed several dead Chinook and one live one and so had tied on a small egg pattern as my last fly, but it wasn’t even getting me any bites. At this point I tied on one of the best dry fly patterns ever made, a stimulator. Actually I tied on two stimulators, one that was bigger and orange and another that was the smallest I had put in my box. I tied the big stimulator on because I could see it. I tied the second smaller stimulator on because I had seen a couple of very small yellow stoneflies flying about. They were really small though and I had nothing in my box that would match it. Where I tied my flies on was above Elk Creek a little ways, so the Minam was pretty small. I was not disappointed with its size though, I thought it was plenty fishable. Elk Creek alone was fishable if you like fishing really small creeks. Before switching my flies I examined a lot of rocks near the shoreline and found no big stonefly cases. I also began to scoop up handfuls of gravel and sift through it looking for bugs. I found none. Examining the bottoms of rocks I didn’t find any mayfly nymphs attached either. The only thing I was seeing for insect life were cased caddis scattered about, but I didn’t think they looked especially abundant. I began fishing again upstream with my large and smallish stimulator. And fish began to rise. I landed several rainbows around eight inches that had bellies that were quite large for their length. I assumed they were full and large from loose eggs. I again caught a very small bull trout on the stimulator. I fished my way back downstream towards camp and found only rainbows in that eight to ten inch range. I did not hook or see anymore bull trout which kind of surprised me. I took a temperature reading of the water and it was in the low to mid 50’s. So water temperature was not an issue. Abundance of food might be an issue though. After returning to my camp I decided to move back upstream one more time to fish a deeper slot below the bridge. I cast my two stimulators just under the bridge and a small fish bounced them up into the air. I cast again a little more downstream and a sizeable fish took my larger stimulator. The fish felt healthy but it did not fight like a rainbow. As I got it closer I began to think that is was a bull trout. Now I was getting confused. Why was I confused? Although I have recently caught some bull trout on dry flies, the bull trout were all under eight inches. Juvenile bull trout may take dry flies, but I have personally never witnessed an adult bull trout taking a dry fly and I have fished a lot of water where bull trout reside all over the Blue Mountains. So when this about 14” fish took my dry fly and then didn’t fight like a rainbow, and then did not look like a rainbow I was confused. I examined the fish carefully. It had red on its paired fins on its lower body and had black markings on its dorsal fin. This was a brook trout. This was only my second brook trout I have ever caught. The waters I typically fish are full of rainbows, bulls, and whitefish not brook trout. 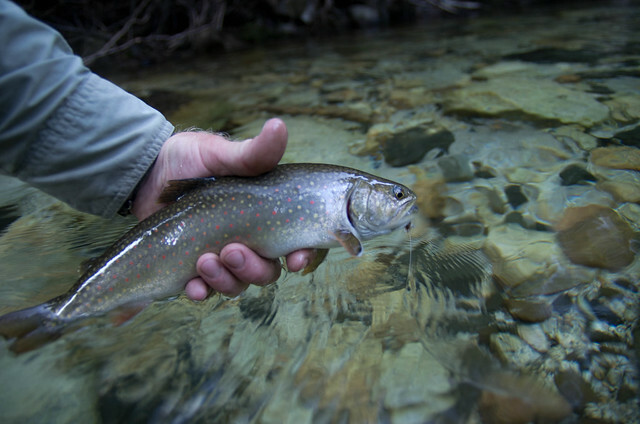 Brook trout are an introduced species around here and the bad thing about them is that they will cross with our native bull trout, creating sterile hybrids. I like catching bull trout and don’t want to see sterile hybrids so I bonked the brookie on the head and took him to camp for dinner. I was glad I caught this fish because when I gutted her there were eggs inside. I had only brought a small screw on burner for my small propane bottle and wasn’t really setup for cooking fish. I rarely make a camp fire when I am by myself and didn’t feel like using what little daylight I had left to build one. So I found a stick that formed a Y. I sharpened the two points of the Y and impaled the brookie. It didn’t work very well but I was able to rotate the fish back and forth over my small stove until I had it cooked. I was really quite impressed with its flavor too. Fresh brook trout taste pretty darn good. The next morning I walked five miles downstream and then began fishing my way back upstream. Rock Creek and a trail that goes out to the Catherine Creek trailhead was at the end of five miles and I thought that was a good turn around spot. Fishing back upstream I found similar results to the evening before. Rainbows in the 10” minus range were plentiful, but I did not see one bull trout or brook trout all day. Most of this section of river was gravel beds that made good spawning habitat for the Chinook that were lying about dead in the river. There were also several long boulder stretches where the river steepened and lost elevation quickly. Thrown in here and there was a nice slab of bedrock that would cause the river to make a decent pool and run. At many of the deeper spots I fished with a streamer and nymph combination, but found nothing bigger in the depths. The water was really clear and I spent quite a bit of time trying to spot fish in the pools but was always disappointed. It is a beautiful river no doubt. But after fishing 3 ½ miles back upstream towards camp my feet were feeling a bit worn from sliding on rocks all day and I had caught enough smallish rainbows. I got back on the trail and walked the mile and a half back to camp. That night as I lay in the dark with my headlamp on reading a magazine, two huge October Caddis began trying to land on my face. I had kept up my big and small stimulator fishing for the most part all day. The fish seemed to prefer my larger orange bellied stimulator better and now I knew why. I had switched my smaller stimulator out for a number of different dries but none seemed to work any better. Perhaps these fish up here only have two good food sources: Chinook eggs and October caddis. I have read that there are two possible fish passage barriers farther downstream. One is a falls and the other is an old splashdam from logging. Some fish obviously get past. There was a fair number of Chinook spawning up here, so I would assume steelhead make it up this high as well to spawn in the spring. My only question then is the bull trout. Can the bull trout make it past the falls and splashdam? I only saw one small bull trout in water that I thought should have been full of them. Most eastern Oregon rivers have pretty good populations of bull trout. Reading different studies a common limiting factor to delisting a particular population is downstream water quality or quantity issues. Bull trout tend to migrate a lot, moving out into bigger river systems in the winter to forage before moving back up their home waters in the spring. This is why bull trout get so big, they move to where the best food sources are throughout the year. Lightning and thunder came before dark Sunday night and then it began to rain fairly hard. Monday morning I screwed around camp for awhile hoping my tent would dry out a little before packing it up for the hike out. I finally gave up on that idea and started walking out at 9:30. It was once again a beautiful hike and the 12 miles and 3,100 feet elevation gain didn’t feel bad. I thought it would be harder really. My left foot began bothering me around 10 miles again. I broke that foot in high school and maybe it is a little weaker or less functional in some way that only becomes apparent after hiking with a pack for 10 miles. This entry was posted in Minam River. Bookmark the permalink. I love your blog! I’ve been up the Wallowa and the Lostine Drainage to Lakes Basin but have never yet made it up the Minam. Lived in M-F back then so it was a lot closer. Incredibly beautiful country, maybe next summer.? With your foot giving you headaches you might need to go back to a Minnie Pearl?? Great photos, and I especially enjoy the ones of your boys. I do still have a horse and I had thought about taking it, but sometimes simpler is better. When you have one horse it also feels like you a need a second: one to pack you and one to pack your gear. I tried riding with a pack on once and didn’t care for it. Thank you. I really enjoy your writings. Somehow, after I turned 50, all my ventures into the woods evolved into Cecil B deMille “cast of thousands” undertakings. I envy your solitude and I want a dog like Mollie. I have been enjoying taking Molly since my last cougar encounter. From time to time I have to threaten to leave her at home after she rolls in the stinkiest dead salmon she can find. But after wading the deepest parts of the river I find she “self cleans” pretty good. Thanks for the entry, it was a good read. I went on a week long hike in late August and fished the Minam at Red’s horse for a couple days. It was incredibly hot and there was almost zero action. There was a “professional fly fisherman” staying at the ranch and he was totally decked out from head to toe with gear. He had a photographer with a full tri-pod set-up following him around, apparently writing an article for a fishing magazine. Not even he was catching anything. Both my “fishing in oregon” guide type books (which are generally not terribly accurate) say there are rainbows to 15″ in the minam, along with bulls. I was convinced that there were NO fish in that river, except that I have an underwater camera and my friend inadvertently filmed a school of fish holding in the swimming hole right by our camp (across from the Minam’s private airstrip). Sure enough, there on video when I got home were decent sized rainbows, a few of which looked to be in the 13-15″ range. We had ran nymphs through there with absolutely no luck. The 3 different guidebook entries I’ve read on the Minam all say that the fishing on the lower river slows in August. After seeing the fish holding in that hole I vowed to return to the Minam one day in late September when the weather cooled and the October caddis hatch was in full swing (I saw lots of OC in their casings while walking the river). But, I live in Portland so who knows when that will be. 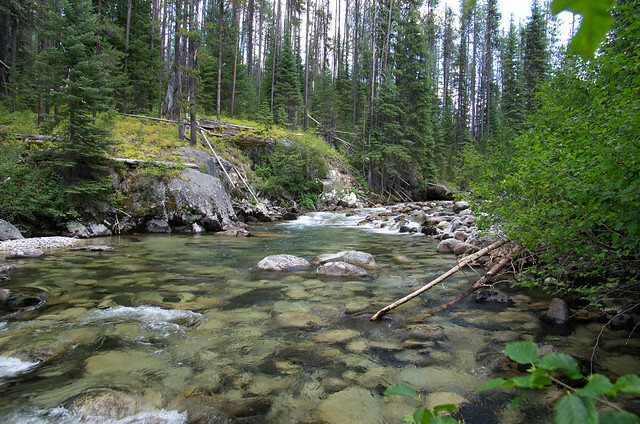 Another stream I fished on that trip was bear creek. Hiked in 4 miles and fished for a couple hours near the guard station before heading up up up to the Standley cabin. My eagle cap guide book said that fishing was “sometimes good for fairly large trout” on that stretch of Bear Creek. At first we caught the typical 10″ rainbows on stimulators, which was fun. Then my buddy began fishing a likely looking run. At first he got nothing, but after more casts than I would have made, his fly sunk below the surface and BAM! fish on. It was dark and in the 15″ range, it swam right past him and busted his line after swimming into the current. I assume it was a bull trout, because later as it was getting dark, I landed about a 13″ bull on a yellow/red stimulator. Definitely a bull and not a brookie. Anyway, interesting stretch of water that you might want to check out this summer if you don’t mind fishing smaller creeks. There’s a great camp spot right across the goat creek bridge. And if you ever get down south check out the Blitzen river if you haven’t already, awesome hike in river with amazing fishing for 10-20″ native rainbows. Again, thanks for the read! It is great to hear about your experience. It sounds like I couldn’t have missed you by much or the “professional” fly fisherman with designated camera man. I am sure there are rainbows to 15″ in there, but that is the exception rather than the rule. Rainbows up to 10″ is much more common. I have noticed that guide type books always like to say the best they can which inevitably leads us to overestimate the fishing. I find it is better to go and simply enjoy each area for what they are. Whenever I come to a piece of water with a preconceived belief of what the fishing will be, I am often disappointed and miss out on a whole lot. For a place like the Minam they are probably relying on information primarily from the Minam Lodge and I am sure they do not want to shoot themselves in the foot by giving too realistic picture of the fishing. That said, my first trip in several years ago found some of the best fishing action in the vicinity of the Lodge and airstrips. I hiked up from the Rock Springs trail, fished downstream four miles from there and fished up past Red’s. The best fishing I found that weekend was from just below the lodge to a little upstream of Red’s. The Blitzen has been on my list for some time, but there are so many places I love to hike and fish close to home that it is hard to make myself travel real far. I think I could spend my life exploring Eastern Oregon alone and always find new discoveries. I also forgot to mention, you barely missed the October Caddis. First of September you start to see a lot of them out in the evenings. My first trip in there several years ago was over Labor day weekend at the beginning of September and there was a healthy batch of the big orange guys out each evening. Grant – I actually emailed with you and your friend (Jeff i think) a year or 2 back asking about the Wenaha. You provided me with great info but the trip fell through and I have yet to make it there. But anyway thanks for the info and it’s high on the list. This fall I will have a decision to make between a few days on the Wenaha or the Blitzen. I hear what you’re saying about the fishing books, I have a similar passion to yours except instead of remote rivers, I pack my float tube into remote wilderness lakes in the cascade range (I love remote rivers just at much but we don’t have them here quite like you do out east). I’ve often thought of starting a blog detailing my adventures and your writings inspire me to do so. But again regarding the books, to say they’re a loose guide might be generous, especially when you factor in lakes that are, or used to be, stocked. I hike in the Wallowas most summers so I’m sure my adventures will take me back to the minam at some point in the next few years. My experience with adult fluvial Bull Trout taking dry flies is somewhat different than yours. I’ve actually caught a number of the 18-24″ adults on dries, particularly in Bear Creek, but also in as big a river as the lower Grande Ronde near Troy. Nevertheless, yours is a great tale about a great place. Over the past several years I have heard of other people catching fluvial bulls on dry flies as well. I would still say it is not common. Do you recall what time of year you have caught bulls on top? I would be willing to bet the timeframe you caught them on top was a fairly narrow window of the year: late summer early fall? Just after spawning when a good food source appears frequently on the surface in the form of October Caddis?